Today I want to tell you about a super fun and wholesome art activity in Cincinnati. I've been to Art on Fire twice, and I absolutely loved both experiences. My first time, I went to a ladies event with my mom and some of her friends. However, this event was 10,000% fun. I was looking for Friday night plans, so I did what every bored college student does... I called my mom! She told me about this craft night she was going to with some friends from church and homeschool. Did I want to join? Painting and pottery? I'm so in. I hadn't been there before, but I had noticed this little art studio next door to Graeter's Ice Cream. If you've spent any time in Cincinnati, you know that Graeter's is the greatest ice cream chain in the world. Graeter's is a Cincinnati classic that's been scooping up happiness, peace, and ice cream since 1870. Art On Fire is a creative arts studio owned and operated by Toni Smith, a gem of a lady. 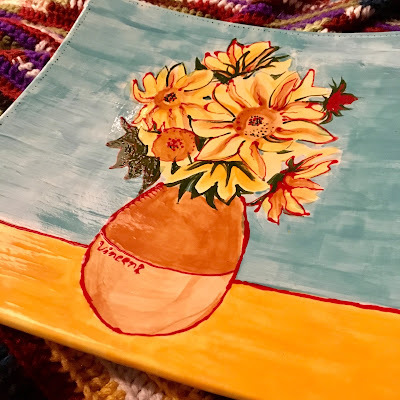 Art on Fire welcomes individuals, groups, and events, offers classes, allows other artists to use the kiln, and has space for artists to sell their work. It's a great place for birthday parties, bridal showers, scout troops, or families. You can also purchase kits to make string-art or other not-so-messy crafts at home. We were even allowed to bring in our own snacks and drinks - a real party! I think next time I go I'll stop next door and get some goodies from Graeter's. Why didn't I think of that before? Art On Fire is definitely a labor of love! Spend any time talking with Toni, and you'll know how much she loves her business. She is kind, knowledgeable, and possesses the patient heart of a teacher. Toni explained the whole ceramics process for us before we got started, and she also lead a guided canvas painting activity so some of the ladies could create their own wall art. There were four of us painting pottery and six painting canvases, so we could all talk and just have a good time. she sees it here. Too bad! She's so pretty! I was also impressed with how affordable it was. There are set costs for canvas painting, according to the size of the canvas. For pottery painting, there's a small studio fee which covers the cost of glazing and firing, and then you pay for whatever ceramic item you want to paint. These range from $1-$50, with everything from little magnets and Christmas ornaments to flower pots, figurines, coffee mugs, and kitchen ware. I've always had a weakness for square plates, so my first time at Art on Fire I chose a 12"x12" square serving plate, which was $25. Above you can see a work-in-progress photo. I've always loved Vincent Van Gogh's sunflowers, so I copied the image on my plate. I had a lot of fun figuring out what colors to use and layering them to get the effects I wanted. There are tons of colors available, so no mixing required. And it was all so easy! You just pick the colors you want, grab a brush, and paint away. The paints dry very quickly, but you can always paint over a mistake. Mom made a pair of smaller square plates to give to my sister and brother-in-law as a wedding gift. She loves the beach and swimming, and he's a captain in the US Army, so Mom painted "Mrs. Mermaid" and "Mr. Captain" on the plates, surrounded by colorful designs. They turned out adorable! goes to her because I forgot to take pictures! bright and beautiful colors for a bright and beautiful woman. The second time around was with my mom again... What can I say? We like crafting together! For months I'd been wanting to paint a yarn bowl for my grandma, an avid crochet-er. My grandma is an amazing, loving woman. She delights in colorful flowers, birds, and tropical fish. Her Facebook and Instagram accounts are full of birds, sunsets, flowers, and her grandkids. I wanted to give her something practical, because her hands are always busy making gifts for others. Well, December rolled around and I still hadn't done it. I finally contacted Toni at Art on Fire, hoping she had yarn bowls available or could order one for me. I knew I was cutting it close by doing this right before Christmas, but Toni was awesome. She set aside the last yarn bowl in stock for me! Inspired by some of my grandma's favorite things, I painted the bowl with bright yellow, orange, and purple fish. It turned out just how I wanted, and I was able to pick it up just in time for Christmas! The perfect gift - my grandma loved it, it was fun to make, and very affordable. This is why I draw, paint, and do collage. It's that instant gratification. I guess I'm just too much a millennial for pottery or ceramics? Kidding, I know many people my age who love ceramics! My point is, I just don't like waiting around a whole week before getting to see the final result. Thankfully, the finished pieces are always well worth the wait. The colors, pale and dull before firing, come out of the kiln rich and lovely. Compare the first photo at the top of this post with the photo to the left. Both are true-to-color, not edited or filtered. Amazing transformation, huh? For someone who's done very little with pottery and glazing, this was a really fun activity. And since the raw bisque pieces are fired after painting, it's all permanent. There's no washing off or fading, like when you decorate a mug with sharpie markers... no matter how many times Pinterest tries to tell you the sharpies won't fade.